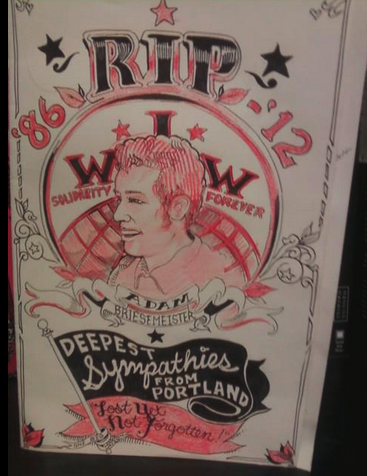 An obituary of Twin Cities IWW member and anarchist organizer, Adam Briesemeister. On March 21 of this year, members of the IWW and broader community in the Twin Cities were shattered by the tragic news that our Fellow Worker Adam Briesemeister perished in a house fire early that morning. It has been very hard to believe that Adam is no longer here. As the year draws to a close, I’d like to take a moment to remember him. A few days after the tragedy, friends, family members, fellow workers, and comrades gathered in a park in Minneapolis to celebrate Adam’s life and mourn his departure. As people shared pictures and stories, a portrait emerged of a man who was many things to many people- an actor, a friend, an anarchist, a Wobbly, a worker. To me, Adam was a comrade in the IWW, and an actor. He had leaped at the opportunity to play multiple roles in “The Silent Room,” a play one of our branch’s members wrote about his experiences of wage slavery and rebellion at Starbucks and IKEA. He had happily played the parts of both a union-busting lawyer and a rebel café worker, squeezing rehearsals into a schedule already jam-packed with radical projects. Adam never said “no” to an invitation to participate in a campaign, and never backed down in a struggle. As people shared how they had known Adam, we saw that even as he was many things to many different people, he also touched all of our lives in the same way. It is almost impossible to find a photo of Adam where he is not smiling. He was human like all of us, and I’m sure he had his bad days, but I haven’t met anyone who can remember a single day that Adam was cranky, discouraged, or outwardly pessimistic. Whether he was your friend, coworker, fellow actor, fellow Anarchist, or Fellow Worker, his love of freedom and humanity was infectious. He was a revolutionary to the core. Adam lived without compromise. We found out that in fact, Adam gave up his life rather than give up his values. He was the first in the house to wake up during the early-morning fire. Rather than save himself, he woke up his roommates so that they could escape safely. He died of smoke inhalation while attempting to rescue the last person in the house, who fortunately survived. Adam’s death is a terrible tragedy. It is hard to believe that this great comrade is no longer among us. But in so many ways, Adam is still here. Adam’s purpose in life was to inspire and encourage others- to “make revolution irresistible,” in his own words. For many of us who knew him, it would be no overstatement to say that Adam accomplished his goal. He showed us how to live. I think about Adam almost every day. Whenever I am afraid, or whenever I can’t decide if a risk is worth taking, I ask myself- what would Adam do in this situation? Would he worry about ruffling feathers by confronting racism and sexism? No way. Would he hold back in order to protect his job or ‘career possibilities’? Absolutely not. Would he keep a distance while others put their bodies on the line? Hell no. He would do the right thing, without even stopping to think twice. He is missed very much by very many. But in many ways, Adam is still among us. Every time we put others before ourselves, every time we do what is right instead of what is convenient, Adam is there. Just as he died so that others could live, it’s up to us to make sure Adam lives on in our hearts, minds, and above all in our actions, for as long as we live.